I’ve been on a knits kick lately. With only a limited amount of time for sewing, I love quick projects and knits are about as quick as it gets – especially knit projects for the babies! I’m all about the instant gratification. After making the giraffe onesie, I decided to look for a pattern for a onesie with sleeves to make a few more outfits for the boys and I found the perfect pattern from Brindille & Twig. 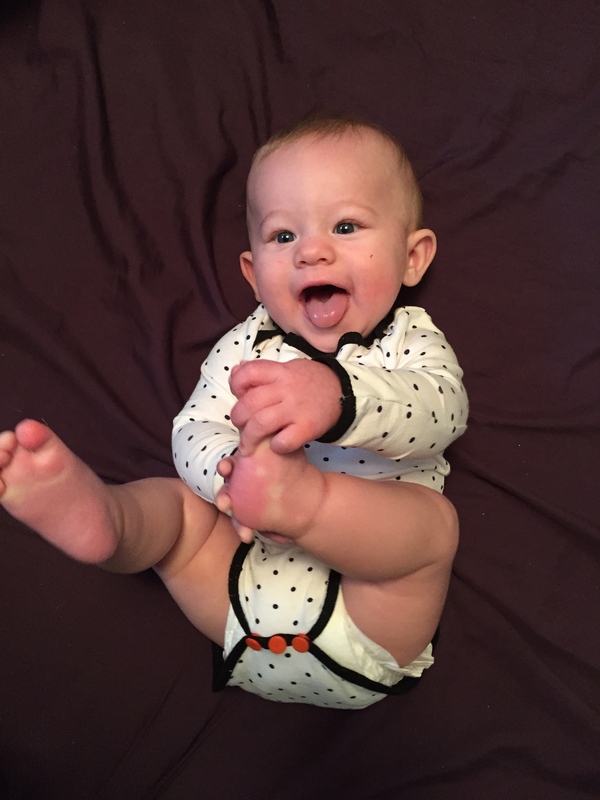 This bodysuit pattern can be made with short or long sleeves from Preemie to 3T sizes. 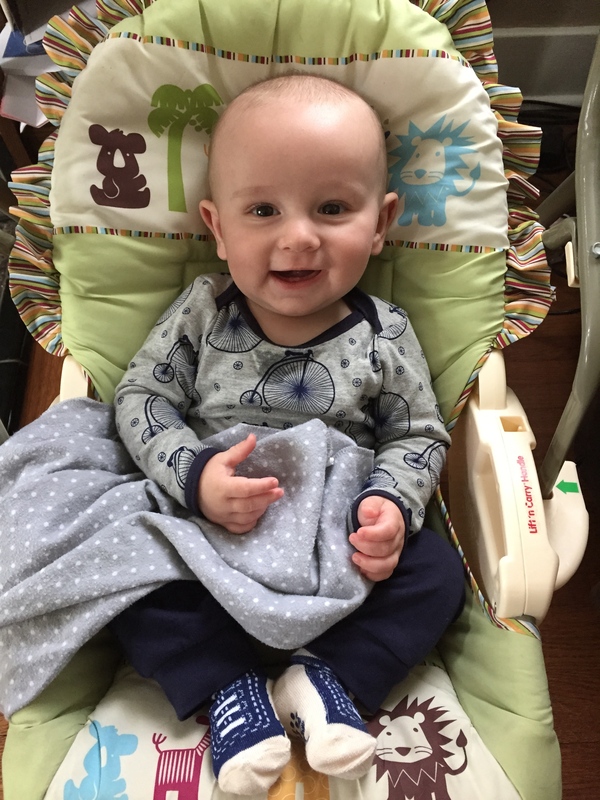 I wish I had found this pattern earlier – I could have made outfits for the boys when they were too small to fit in all of the newborn clothes we had purchased for them before they were born. This pattern is very quick. 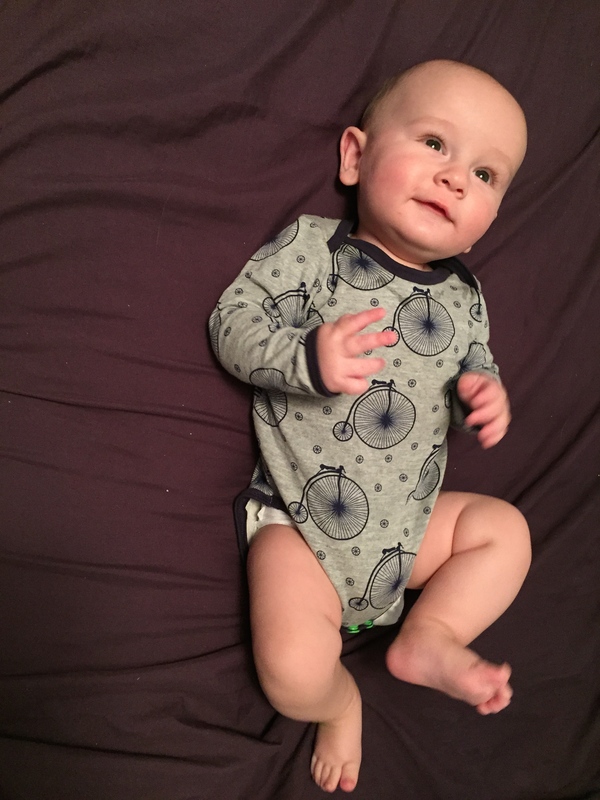 I purchased, printed, traced, and cut out the pattern, cut out all of the fabric for two onesies, and sewed them up all in one evening after the boys went to bed. I made the 6-9 month size for my 5.5 month olds. They are just a tad big, which is perfect. The boys will be able to wear these for at least a week (I swear – they outgrow clothes by the day they are growing so quickly). Construction is very easy. 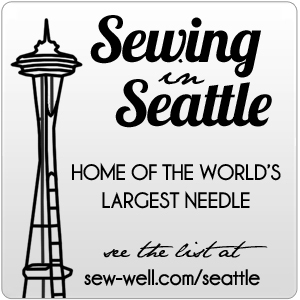 I used my serger for all of the seems and attaching the binding, and then used a narrow zig zag stitch to stitch the binding down. The grey fabric was a 1/4 yard remnant I found a while back that I’ve just been holding on to until I figured out what to do with it. This is the perfect project to use up small quantities of knit fabric! The white polka dot fabric came from April’s Girl Charlee KnitFix. KnitFix is a deal Girl Charlee offers once a month where you buy essentially a grab bag of fabrics. For $69, you purchase 2 yards each of 6 different fabrics, but you don’t know what fabrics you will get until you receive the package in the mail. It’s kind of a fun way to build up your stash of knits, and it ends up being only $5.75 per yard, which is a great price for knits. Of course you run the risk of getting stuff you don’t like… But I’m not too worried about that. I can always use up my less desired fabrics to make gifts for others who will like those fabrics more. For the snaps, I used Babyville snaps and the Babyville Snap pliers. The pattern doesn’t say to use any interfacing behind the snaps, but I really think there should be some to strengthen that area. I worry that the fabric won’t hold up to the constant snapping and unsnapping. But maybe It would hold up better if I used a different type of snap. I’ll have to look into different snaps. Babyville snaps are just so easy to use! 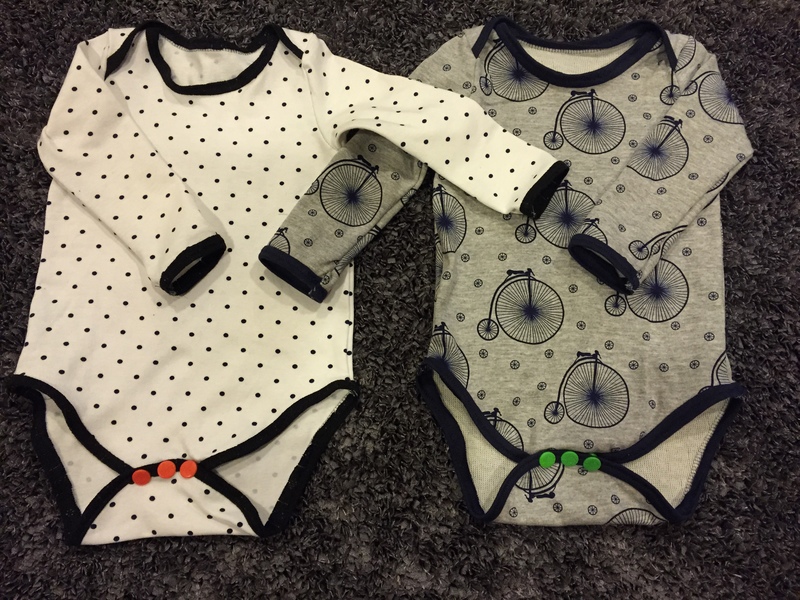 I think I’ll use interfacing behind the snaps next time, too, just to make sure the onesies will last for a while. I will definitely be making more of these onesies in the future. And I look forward to trying more of the Brindille & Twig patterns in the future. 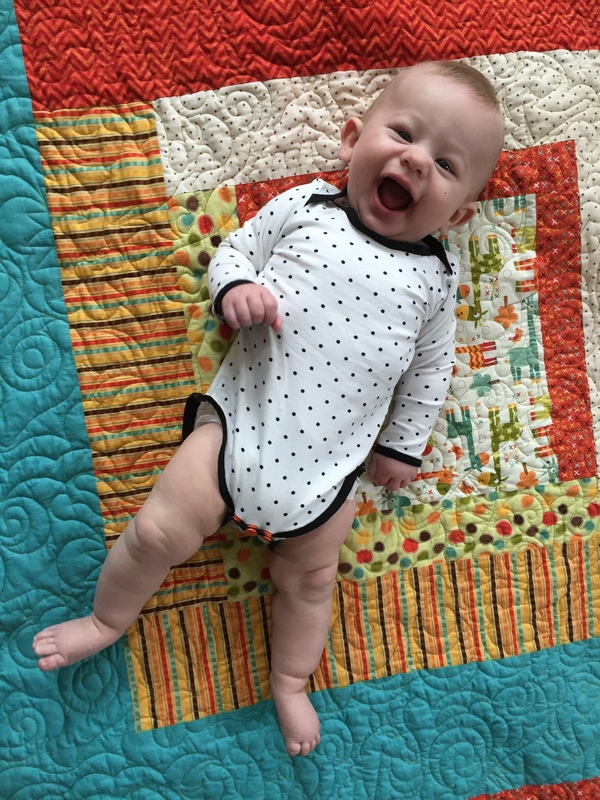 If all of their patterns are as well written as the Bodysuit pattern, then this may become my go to pattern company for baby basics!